A medical cannabis farm in California is taking security very seriously, recently enlisting the services of an Automated Unmanned Ground Vehicle (A-UGV) to patrol its facility. Inverse reports Canndescent is using a Sharp Intellos vehicle for perimeter security and routine patrols – and at least four other farms have also done so via security firm Hard Car Security, which specialises in services to the cannabis sector. 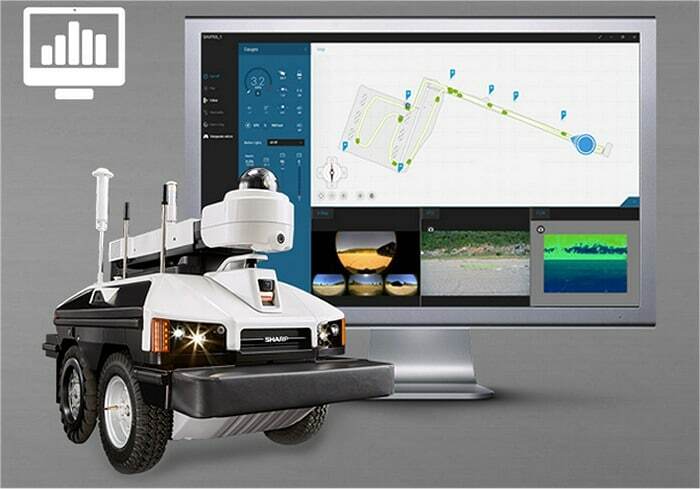 With multi-terrain capabilities, Intellos has a mobile sensor platform able to capture video, audio and environmental data; communicating that information in real time back to base. The robot also provides a visible deterrent and its built-in siren could be handy for scaring would-be thieves off, as would the voice system that can be operated by staff tucked away safely to challenge intruders. The robot can travel autonomously along a predetermined route and respond semi-autonomously to alerts. Optional sensors can also be added to detect hazards such as toxic gases, combustibles and oxygen levels. An adjustable boom enables the robot to peer over and into the cannabis crop. The video system features a 1080p PTZ dome network camera mounted on top of the boom, and four (front, left side, right side & rear) wide angle cameras. An optional thermal camera is also available. Rather than running on fossil fuels, Intellos is an electric vehicle powered by independent brushless motors and comes with two lithium-ion battery packs, offering the potential to recharge the robot with solar energy. Depending on speed, terrain, and the way accessories are used, battery life is estimated between four to twelve hours per charge. “This autonomous robot represents the next frontier in outdoor security,” says Sharp. More on the Sharp Intellos A-UGV can be viewed here. At USD $300,000 a pop, it’s certainly not cheap; but its abilities and potential for saving someone’s life are considered worth it by those using the system. As mentioned, leasing options have also been made available through Hard Car Security. The Intellos could be seen in Australia’s medical cannabis sector in the not too distant future as the local industry starts getting into gear. On a related note, the ABC recently published a report on the lengths Australian farmers will need go to in securely growing medical cannabis.